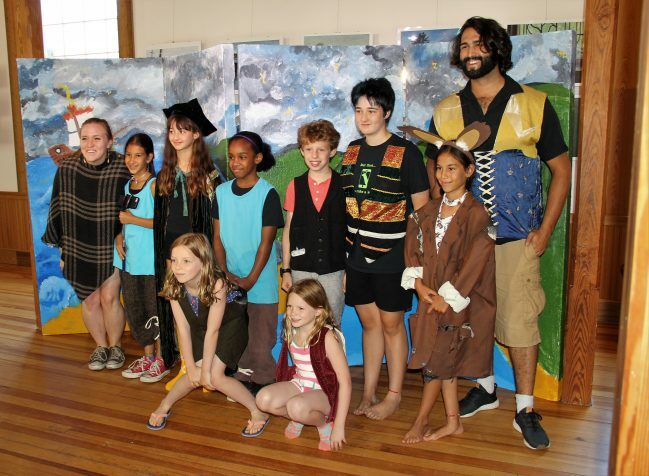 A fun weekly program for ages 9 – 14 exploring the magic of theater and art! Summer Stars is a small, friendly camp focusing on creating art and theater, making friends, working together, providing engaging individualized and small group experiences. Open to children of all abilities. Our camp will be held for six weeks (July 8 – August 16) in the summer of 2019 at MV Playhouse, 24 Church Street in downtown Vineyard Haven from 9 am until 1 pm, Monday through Friday. Each Friday afternoon there is a performance for family and friends, usually in the theater’s lobby performance space. More information will be posted on our website this spring. (See 2018 weekly themes below to get an idea of what we did last summer). Thank you! • Week One: EEK! It’s Ancient Greek Week! origins of comedy and tragedy, masks and myth – and have some fun along the way! • Week Two: Shaking Up Shakespeare! unfold as characters from Shakespeare’s greatest works collide! What could go wrong? We’ve all heard the tales of Little Red Riding Hood and the Big Bad Wolf. week, we will be bringing works of art to vivid life on the stage! guest music director to help us create and perform our own original musical!